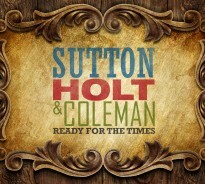 Here is the new CD from Sutton, Holt and Coleman. Ready for the Times is mountain music with a kick! For a DJ hard copy of the CD, email office@davidholt.com with your name, organization, and mailing address or call us at (828) 628-1728. To set up interviews with the band members, contact Betty Nichols: office@davidholt.com or (828) 628-1728. Read more about Sutton, Holt and Coleman here. Track 3: Red Rocking Chair (3:10) A deeply haunting yet rollicking song with modal banjo and guitar; David sings. Track 5: Hotel Wall (3:14) David wrote this song remembering his 14 years on the road with Doc Watson David would wake up early and hear Doc playing in the next room.He’d listen through the hotel room wall. The song features Sutton, Holt and Coleman with friends Sam Bush (mandolin), Jens Kruger (3 finger banjo) and Claire Lynch (harmony vocal). Track 4: Streamline Cannonball (2:42) Bryan sings lead and drives his guitar like a freight train, David is on slide guitar, T. Michael sings harmony vocals and plays bass. Track 1: Johnson Gals (2:18) David’s mouth bow catches your ear and Bryan puts his guitar through its musical paces. Bryan and T. Michael on harmony. Track 2: Down the Road (2:29) One of the first songs Doc Watson learned to play on the banjo. Bryan sings this kicking version and gets the full range of sounds from his mandolin while David propels the music forward with clawhammer banjo. T. Michael on harmony vocals and bass. 1. All three of these musicians are deeply influenced by Doc Watson and all three won a Grammy award with him. David toured with Watson the last 14 years. T. Michael played bass with Doc in the ’70s and ’80s, for 15 years. Bryan’s approach to guitar is similar to Doc’s: Hard driving, yet tasteful and always surprising. 3. Sutton is a first call studio musician in Nashville and can be heard playing guitar on many hit recordings. 4. Holt can be seen on PBS in the Great Scenic Railway Journeys series and was host of the TNN series Fire On the Mountain and the American Music Shop. 5. “We want to sound like Western North Carolina,” said Sutton. “It’s not bluegrass, it’s not old-time, it’s mountain music, and it’s ours. It has a unique kind of bounce. 6. T. Michael Coleman played bass with Doc Watson through the ’70s and early 80s. After touring with Doc for 15 years he played with the Seldom Scene and Chesapeake. He produced many of Doc’s Grammy winning CDs. 7. In 2002 Doc Watson and David Holt won a Grammy for Best Folk Recording. Legacy (a three CD set) features Doc telling David stories of his life on two CDs; the third CD is the two of them in concert at Asheville’s Diana Wortham Theatre, Doc sharing his stories and “legacy” with each song. 1. Johnson Gals (2:18) A civil war song from Western North Carolina played with David on mouth bow and vocals, Bryan on guitar and harmony and Michael on bass. 2. Down The Road (2:29) A driving vocal by Bryan playing mandolin, David on clawhammer banjo. Michael on harmony. 3. Red Rocking Chair (3:10) David plays banjo sings this haunting yet driving song of love gone wrong. Bryan on guitar. 4. Streamline Cannonball (2:42) Bryan sings and shows his lightning fast guitar work, David on slide guitar, Michael on bass and harmony. 5. Hotel Wall (3:14) David wrote this song in memory of his 14 years traveling with Doc Watson. Along with Bryan and Michael, the song features Sam Bush on mandolin, Jens Kruger on 3-finger banjo and Claire Lynch and Michael on harmony vocals. 6. Georgia Buck (2:21) David sings and plays a gut string mountain banjo made in 1870. Bryan on guitar, Michael on bass and harmony. 7. Hangman’s Reel (2:24) Bryan with a blistering guitar solo accompanied by David on spoons and Michael on bass. 8. Ready For The Times To Get Better (3:08) David learned this beautiful finger-picking song directly from Doc Watson. Bryan adds harmony on guitar and vocal. 9. Darlin’ Cory (2:44) Bryan sings and plays banjo while David drives this tune with the mouth bow and Michael on bass and harmony. 10. 15 Cents (3:02) Bryan sings and plays lead guitar on this good humored Doc Watson song. 11. Travelin’ Man (4:09) David sings and plays fingerstyle guitar with Bryan flatpicking this ragtime favorite from Doc and Pink Anderson. Bryan and Michael on harmony. 12. Train That Carried My Girl From Town (3:00) How can a human play this fast? Bryan and David tear it up on guitar and banjo. David and Michael on harmony. 13. Solid Gone (3:07) An old finger-picking tune with an unusual chorus David collected from Inez Chandler of Sodom, NC. Bryan and Michael on harmony. 14. Cindy (2:33) Bryan on banjo and vocals, David on harmonica, Michael with bass and harmony. An unusual version of this mountain standard from Bascomb Lunsford. 15. Forked Deer (2:44) A majestic old time fiddle tune on with David on banjo, Bryan guitar and T. Michael on bass. We appreciate your support and airplay.